The paper counterpart to the photocard driving licence was abolished on 8 June 2015, so how you view your licence information has changed. 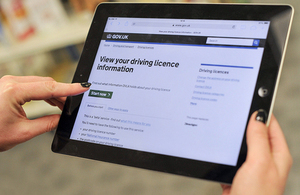 The changes affect driving licences in England, Scotland and Wales. There are different rules in Northern Ireland, where the paper counterpart is still needed. The paper counterpart to a driving licence has had no legal status since 8 June 2015. You should destroy yours if you have one, but keep your photocard driving licence. Paper driving licences issued before 1998 are still valid. Do not destroy your licence. When you update your name or address, or renew your licence, you’ll only get a photocard licence. When you get penalty points, you’ll still have to pay any fines and give your photocard or paper licence to the court. They’ll give the licence back to you, but it won’t have penalty points printed or written on it. You’ll only be able to see penalty points using the view your driving licence information service. You can also check by phone or post. You can check someone’s driving licence information using the ‘check code’ they’ve given you. You can print or save a copy of the information. You can also do a check by phone. If you’re a lorry or a bus driver living in Great Britain with a driving licence from an EU country, you need to register your licence with DVLA. The counterpart was abolished to save motorists money, reduce red tape, and make sure that employers weren’t relying on potentially out-of-date paper. It’s part of DVLA’s strategy to get the right drivers and vehicles taxed and on the road, as simply, safely and efficiently for the public as possible.